Dream Cream | £11.95 // I haven't had a tub of Dream Cream for a while so I added one to my basket. I like to pair it together with Dream Wash which has sadly now been discontinued but also brought back as a slightly different product. I find the rose and chamomile scent really relaxing and it really helps to soothe and prevent my eczema from flaring up. This tub also lasts me a really long time as only a small amount is needed. Rose Jam Bubbleroon | £3.75 // I've tried this before it was reformulated so I'm intrigued to see how it has changed. The most obvious way is how it looks and I have to say I definitely prefer it this way. It just looks a bit more put together and less home-made. I looks slightly less like a macaroon now though. As you can probably guess by the name that the main scent of this bubble bar is rose but there is also lemon and geranium mixed into it. Honey Bee Bath Bomb | £3.35 // I love this bath bomb although I haven't used it for a good year or two. As you'd imagine it has a honey scent along with a hint of honey. The scent reminds me of Honey I Washed The Kids Soap which is another Lush favourite of mine. Karma Bubble Bar | £4.25 // Despite liking the Karma scent and it being made into several different products, I don't think I've ever actually bought any of them before. As soon as I saw this purple pyramid in the shop window though I knew I just had to buy it. As with most of the bubble bars, they can be broken down into several baths. I usually stretch them out as far as I can as I do have quite a small bath tub and can usually get four or five baths out of one. The scent of karma is a mix of lemon grass, patchouli, orange, pine and mango along with lavandin which is closely related to lavender and has a similar scent. 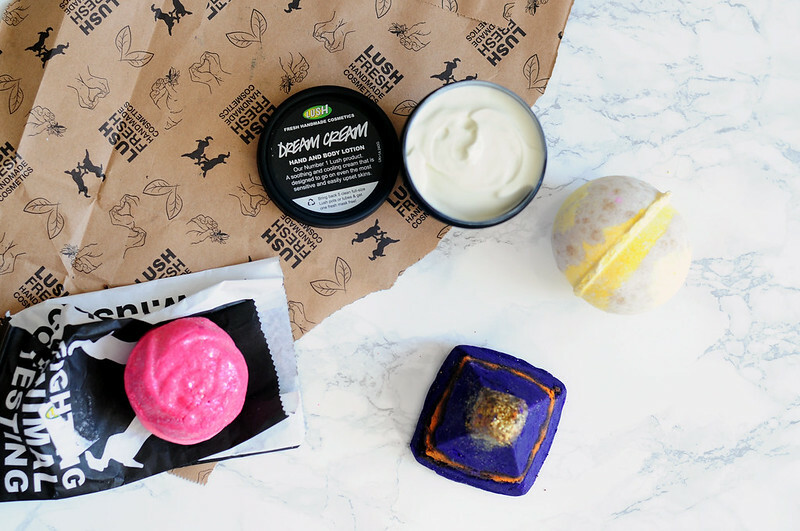 I recently went to Lush too, they have such lovely products in at the moment! I love the sound of the Rose Jam Bubbleroon! I love Lush's bubble bars, and they are even my kids favourite too! I haven't tried that one though, but the comforter is our favourite.